Who knew a turtle exhibit could spark a lifetime of love? Who knew a turtle exhibit could spark a lifetime of love? In 2008, Kelsie Persaud of Little Rock and Evan Somers of Indianapolis went on a trip to the zoo together during a medical summer internship in Memphis. While looking at the turtles, he nervously asked Kelsie on a date to a drive-in movie theater. That night, the two sat in the hatchback of his car to watch Wall-E. Neither of them had any bug spray and Kelsie was bitten by quite a few mosquitos, 38 bites to be exact. They spent the rest of the night laughing about what happened, and soon after Kelsie realized that Evan was the only one she wanted to watch movies with. 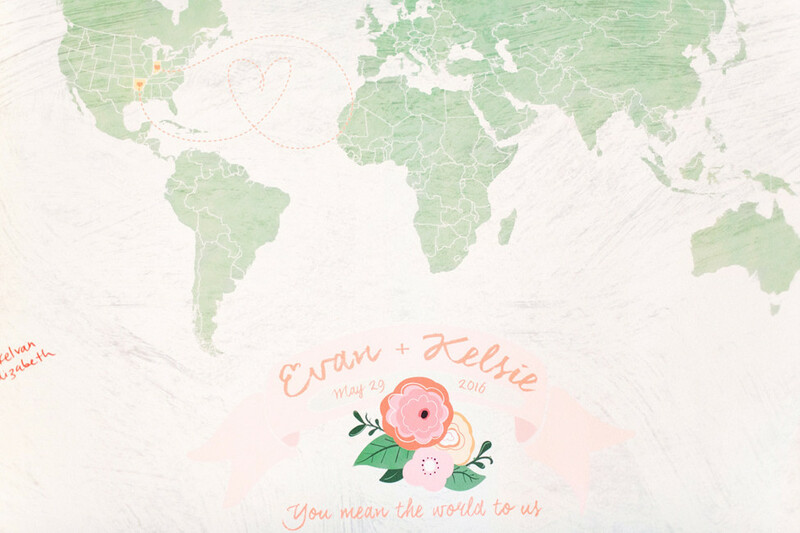 Six years into their relationship, Kelsie and Evan took a weekend getaway to Williamsburg, Virginia to celebrate their anniversary. They checked into their hotel and headed off in search of a good place for a picnic at The College of William & Mary campus. When they had picnicked and had a few glasses of wine, Kelsie and Evan came across the Crim Dell Bridge, hidden in the woods of the campus. Evan read her the story about the bridge’s significance, which said that if two lovers were to meet at the crest of the bridge and kiss, they would be together forever. After he finished reading, they kissed and Evan proposed. Little did they know, about a hundred yards away, a group of college girls witnessed the whole thing. 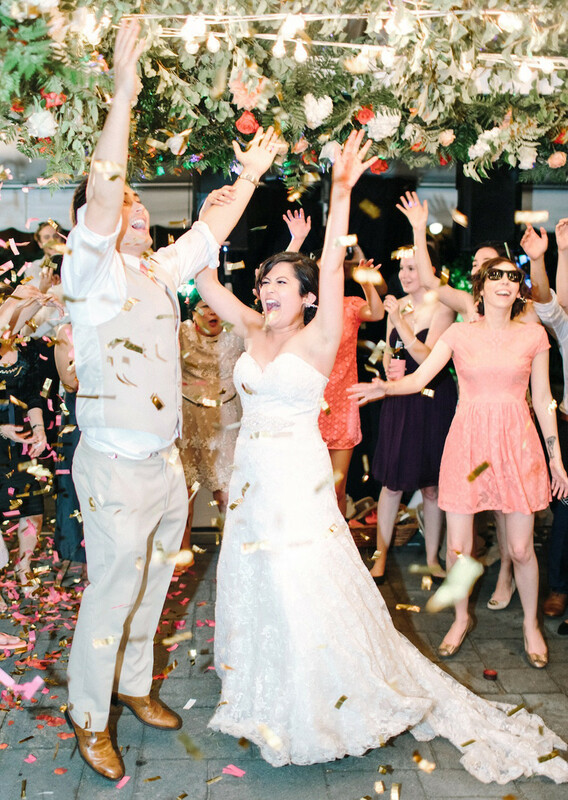 When Kelsie said “yes,” a roar of cheers erupted. 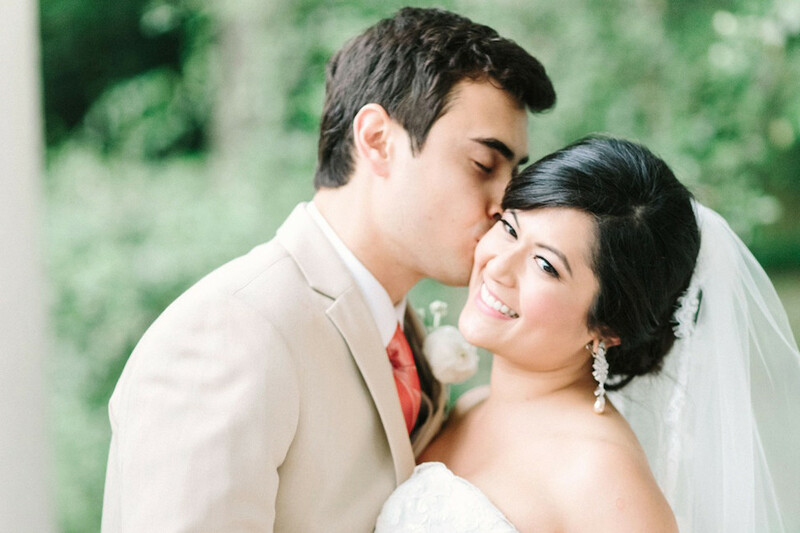 Soon they were planning a gorgeous wedding, which was infused with their Indian and Filipino heritage. 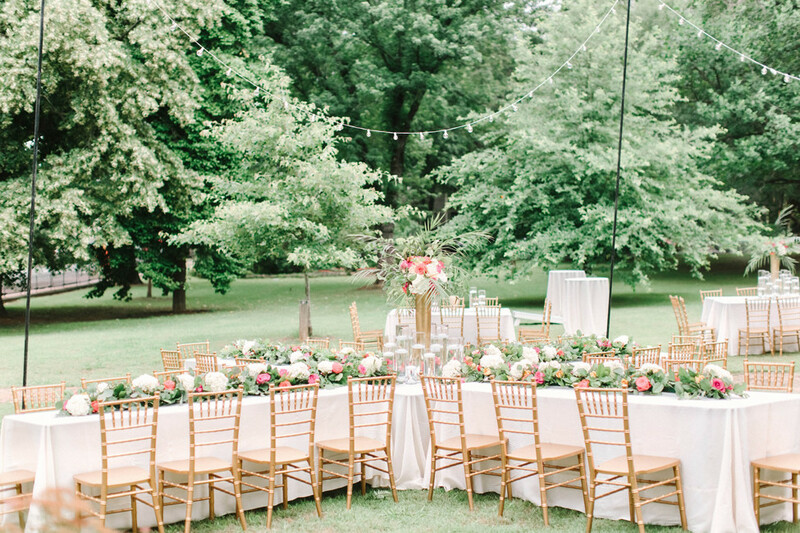 After setting their date for May 29, Kelsie and Evan knew that with it being a late spring/early summer wedding, they wanted to get married outside. 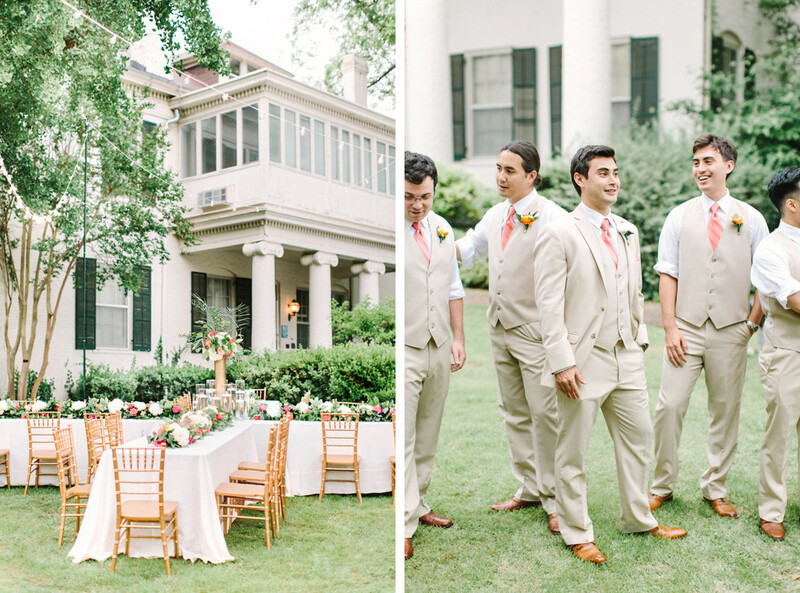 The Terry House was the perfect location for their dream wedding. 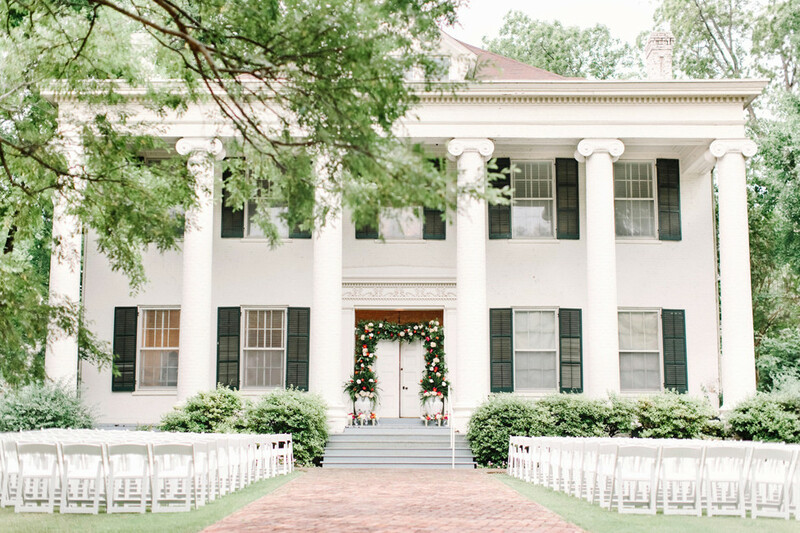 Getting married on the front porch steps and having the reception in the backyard patio gave them the southern touch they were going for. 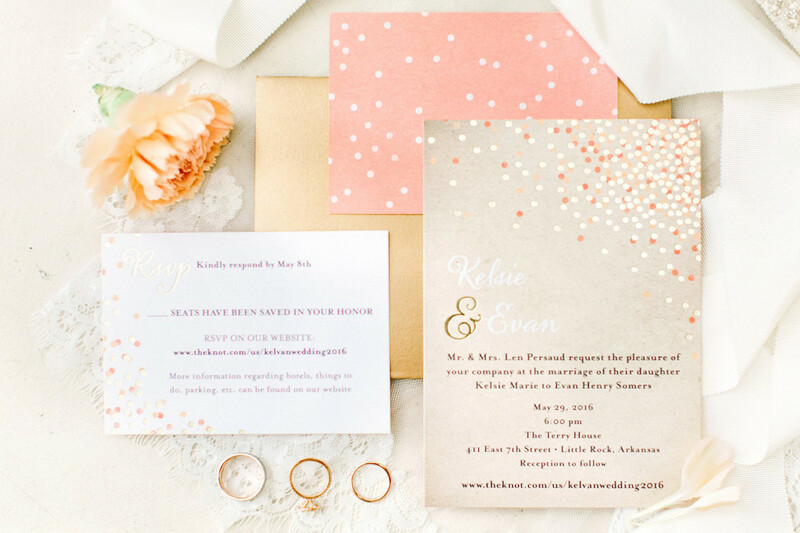 Kelsie chose shades of coral and gold, knowing these colors would be vibrant and fun at their venue. Their flowers brought this vision to life. Working with her florist and wedding planner, they had a ceiling of flowers built for the reception tent, which was threaded with Edison lighting to help create a romantic and whimsical atmosphere. 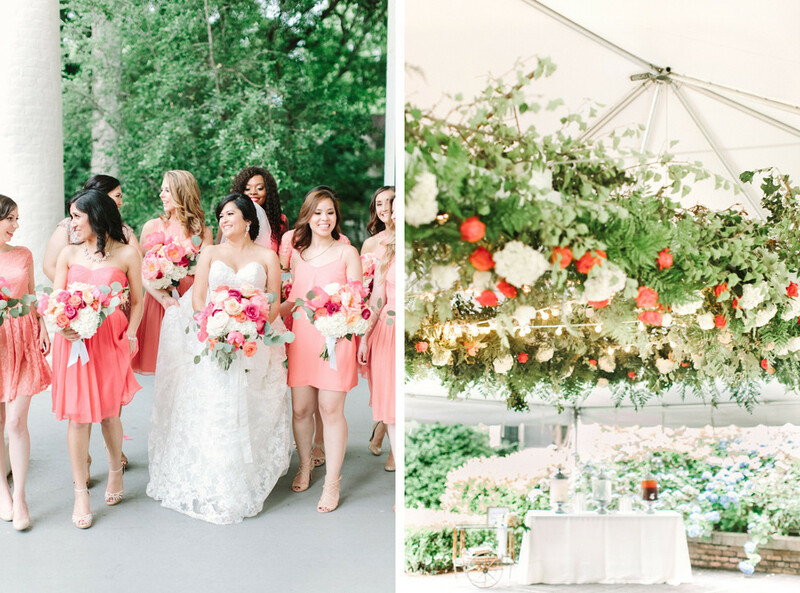 The flowers included pink and coral charm peonies, salmon pink peony tulips, and peach David Austin roses, mixed in with roses and lisianthus, to name a few. 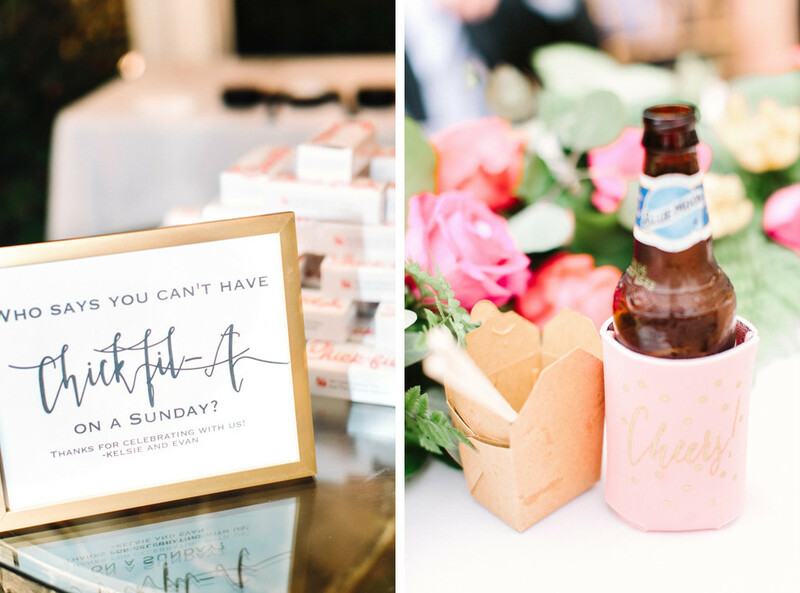 Many of the couple’s family and friends had to fly in from all over the country and the world, so Kelsie wanted to show them what real southern charm was like. 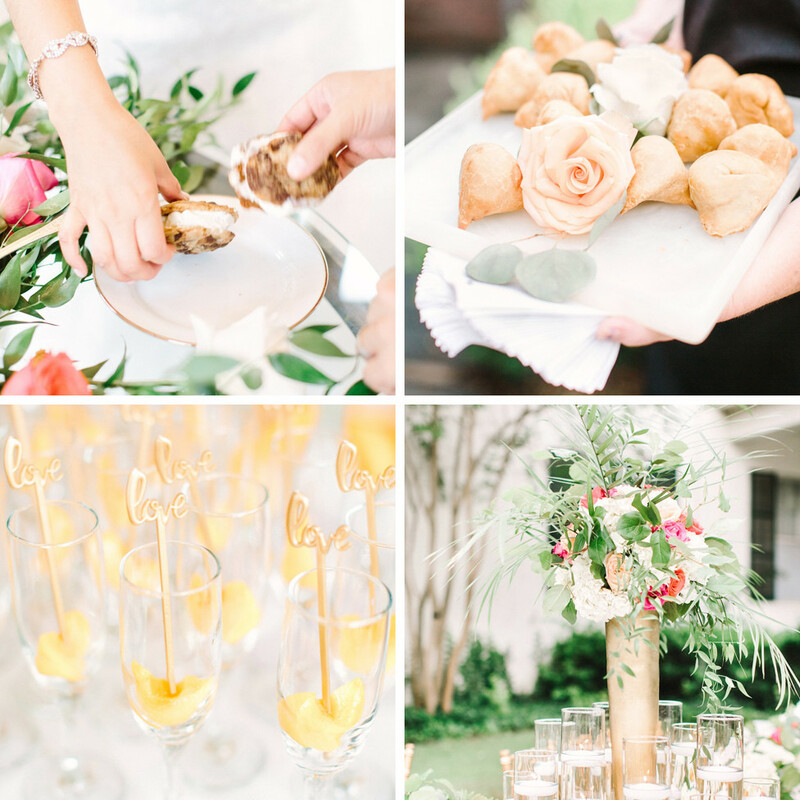 This was achieved in the little details from the food selection and personalized details during the reception, to the intimate ceremony. 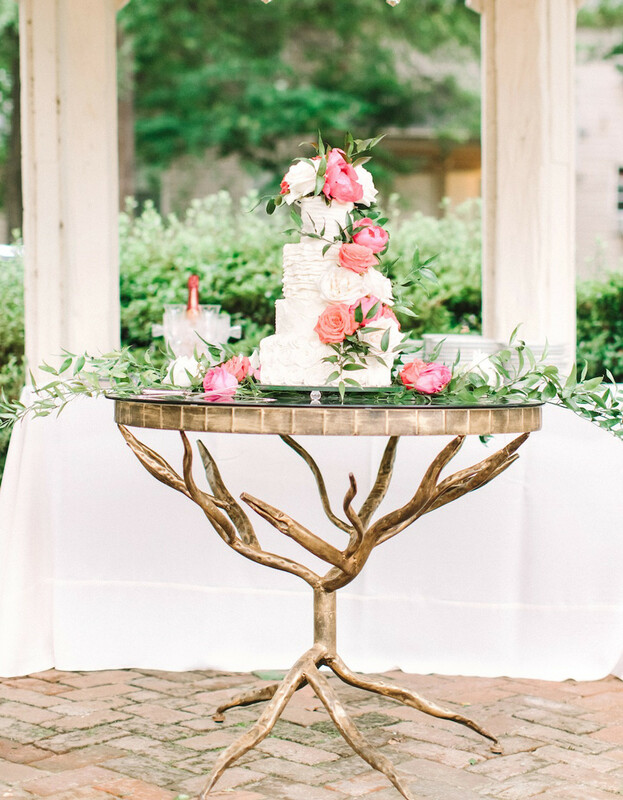 It was all made possible with the help of their wedding planner, Anne Claire Allen. 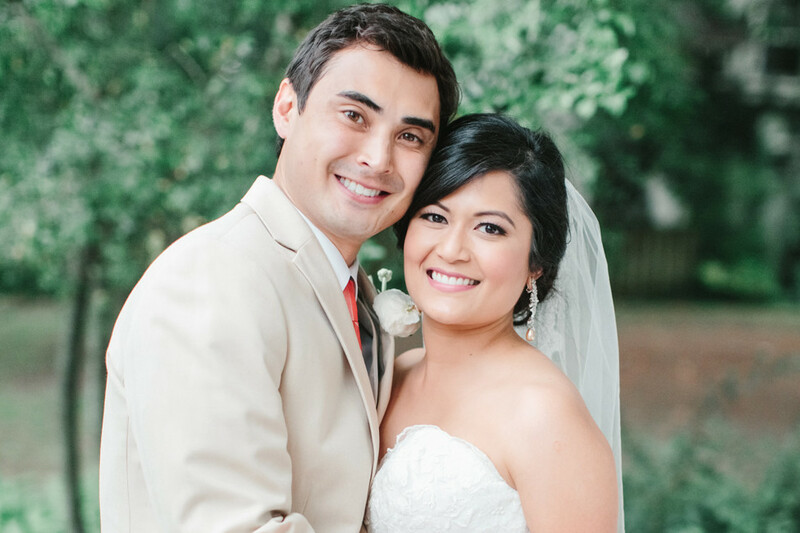 Kelsie and Evan were sure to include elements of their Filipino heritage and Kelsie’s Indian culture represented in their wedding. 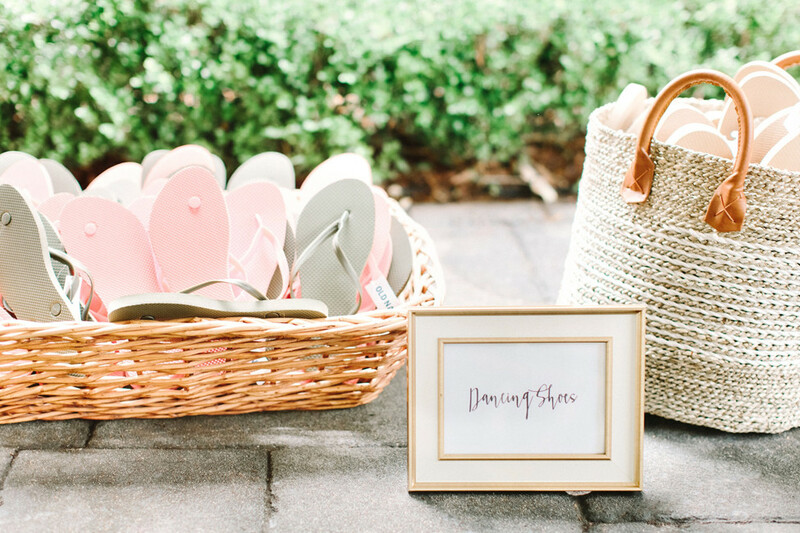 Evan and Kelsie incorporated the traditional Filipino wedding traditions into their ceremony including coins, cord, veil and candle. They also had Filipino primary and secondary sponsors as part of their wedding, who wore the traditional Filipino clothing (barong) during the ceremony. Kelsie had traditional Indian henna done on both of her hands to represent the other side of her heritage. Indian samosas were served as appetizers and traditional Filipino pancit (noodles) and lumpia (egg rolls) were part of the dinner buffet. Finally, Kelsie and Evan performed a Filipino money dance, where guests took turns dancing with the bride and groom, pinning money onto them as they did so.